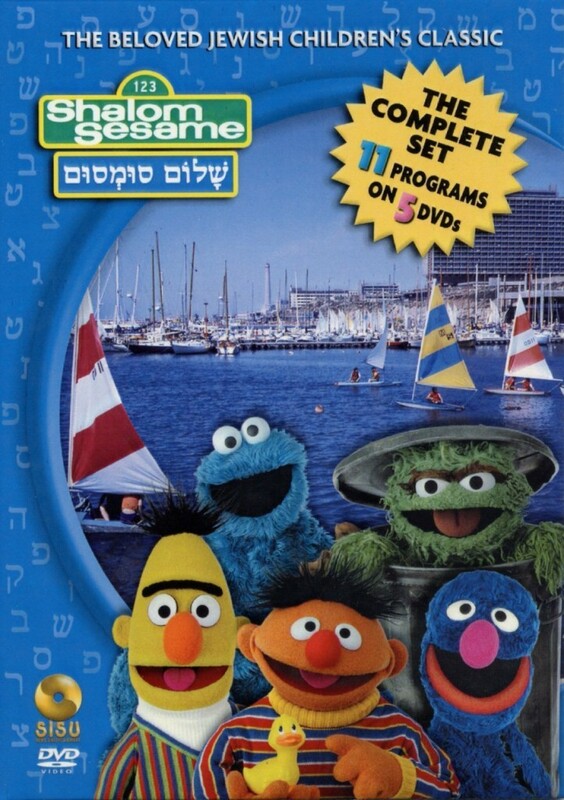 Shalom Sesame is a co-production between Sesame Street and its Israeli counterpart, Rechov Sumsum. The series was conceived as an attempt to bring Israeli life and Jewish culture to American audiences… and was targeted at an older age group than either Rechov Sumsum or Sesame Street, approximately 6 to 12. * Filmed in Israel, this series was broadcast on American television in the late 1980’s to 1990. Having met the characters of Sesame Street 25 years ago with my daughter I have a special affection for the cast and it is wonderful to meet these familiar faces again. On Rechov Sumsum we meet Kippi Ben Kippod, a big porcupine and a counter part to Big Bird, Moishe Oofnik, a cousin of Oscar the Grouch, Benz, Bert, Arik, Ernie, Kermit Tzefarde, Kermit the Frog, and of course Barvazoni, Rubber Duckie. The Israeli virtuoso violinist Itzhak Perlman is a frequent guest. Each of the five DVD’s come with a downloadable teaching guide providing key vocabulary, background information, discussion points, suggested activities, and the English, transliteration, and Hebrew of each song — so you can easily sing along. These teaching guides truly do provide a wide range of material appropriate for pre-school to adult and have everything from coloring pages to Rabbinic teachings and midrashim (homiletic tales). Shalom Sesame Street was well titled ‘The Muppet Beit Midrash‘ by New York newspaper, Jewish Week. Taking place at the time of the Gulf War and out of concern for the American and Israeli performers, the final three shows of Shalom Sesame Street were filmed at Sesame Street’s New York production facilities. This entry was posted in Movies by Cindy Lou. Bookmark the permalink.